A multi level urban landscape realm wrapped around two buildings drove the design towards a highly architectural outcome. 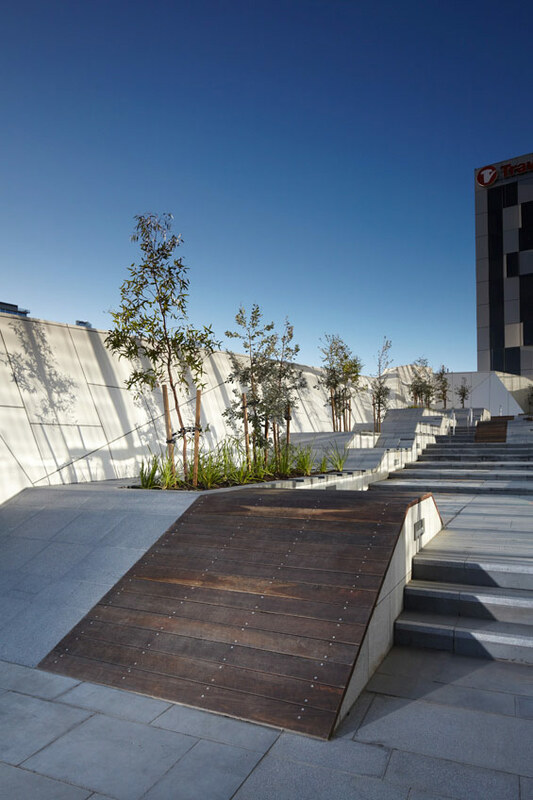 ASPECT Studios was engaged to design and document the streetscape, pocket park, podium forecourt and courtyards for this mixed use development in the Docklands. 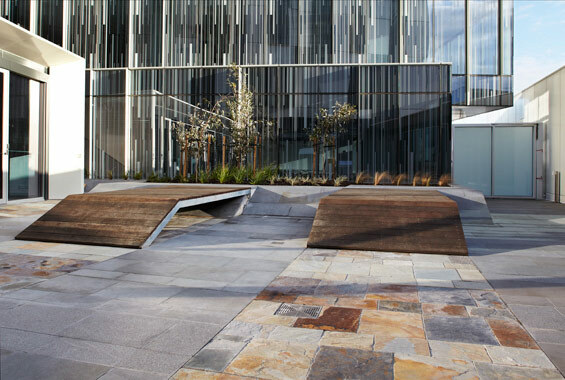 ASPECT Studios was responsible for the design to 717 Bourke Street public realm areas on ground floor, level 4 podium and connection to ground floor areas and bridge connection to Southern Cross Station, level 5 podium areas and connections to level 4 and private courtyards on level 4. The design of 717 Bourke Street sits within our practice’s recent explorations into the inner city. It seeks to create a dialogue with the building, while not losing touch with the need to reveal warmth, niches, and unpredictable spaces. Corporate plaza design has a long tradition in Melbourne and this project like many others seeks to have a real ‘relationship’ between the façade and the horizontal flows of this space. 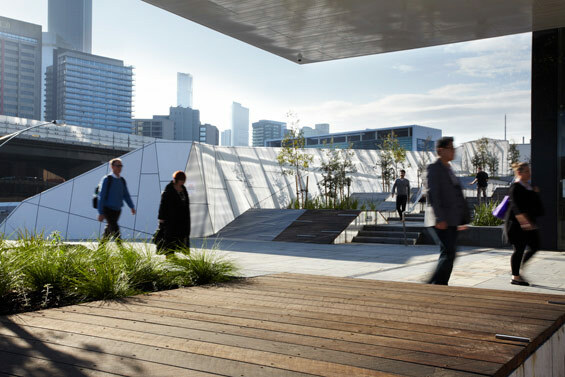 The external podium landscapes at 717 Bourke Street were conceived around facilitating increased pedestrian permeability and activation between Melbourne’s CBD and the predominantly isolated Docklands precinct. 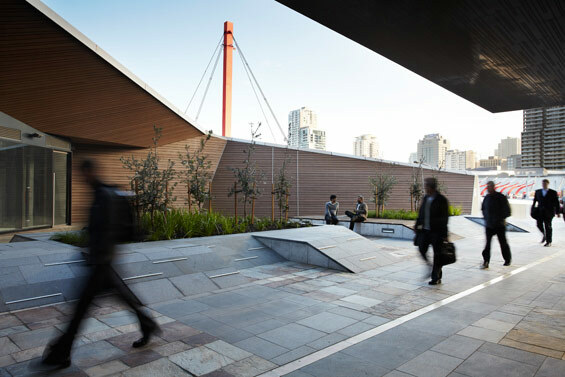 Located proximity to an existing bridge link from Southern Cross Station / CBD to Etihad Stadium, a new footbridge and cascading circulation link creates a series of highly stylised, intimate podium landscapes to provide the first new urban connection from the grid of the CBD to the street network of the Docklands. The design concept looked to seamlessly integrate these podium landscapes with the imposing architectural façade and enveloping canopy form to create a topographical carpet that spreads outwards from the building, blurring the interface between public and private, active and passive, building and ‘landscape’. The topographical carpet is shifted upwards to form occupiable plinths and platforms, and draw apart to reveal the hidden indigenous vegetation within, an acknowledgement of its location on the edge of a former swamp. 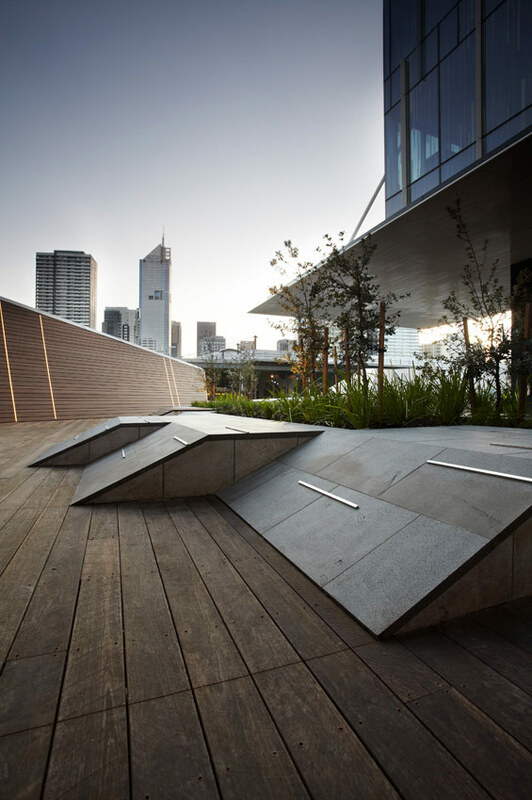 The platforms conceal irrigated podium planter boxes connected into the building’s stormwater recycling system that contain copses of drought tolerant Banksia and small Eucalypts with under plantings of native grasses and strappy shrubs. The platforms provide physical separation from the circulation link to an outdoor café zone, with the timber deck wrapping up the walls to form an overhanging canopy. The carpet itself consists of defined bands of stone paving oriented north-south – granite, bluestone, and two colour variations of splitstone – which are broken down into a geometric mosaic pattern to enhance the architectural façade articulation. The effect of removing continuous joint lines along the east-west direction of circulation is of a shifting surface of texture and small scale. An additional stone surface treatment, of white stone, is utilised in the expression of all vertical faces. This serves to visually contrast elements of differing heights for enhanced safety and legibility, particularly where the angled seating plinths interface with paved areas. Platforms and plinths with their form sliding apart to create protruding timber platforms for seating. Constructed of pre ordered Australian hardwood timber and stockpiled for several months to leach out tannins, these platforms were designed and detailed to eliminate any visible fixing. 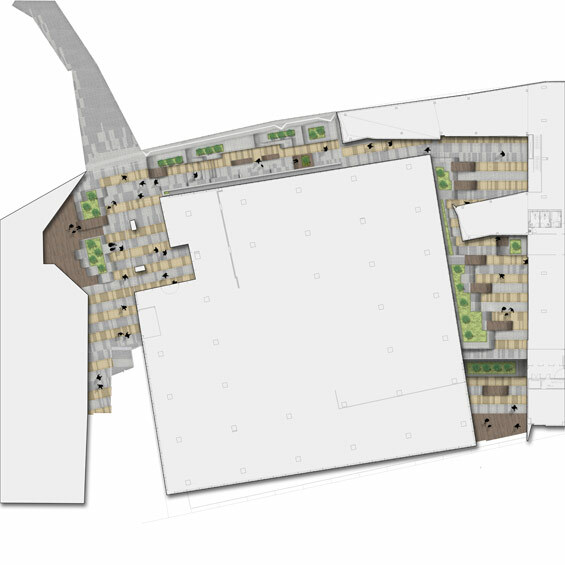 They provide warm natural tones within these shaded spaces, with further platforms located in an adjacent laneway landscape on the ground floor. 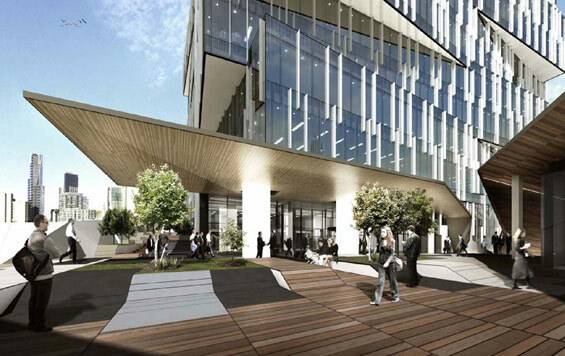 Design to ground floor areas was undertaken in accordance with Melbourne City Council and VicUrban Docklands design guidelines. To maintain consistency between upper podiums areas and ground floor areas, the paving bands articulation was continued from the facade, and merged standard bluestone paving sizes with the variegated paving treatment above.